On September 19, 2017, a magnitude 7.1 earthquake struck central Mexico, killing nearly 370 people. But something good has come from this tragic event: The quake damaged an ancient pyramid, revealing a previously unknown Aztec temple underneath. 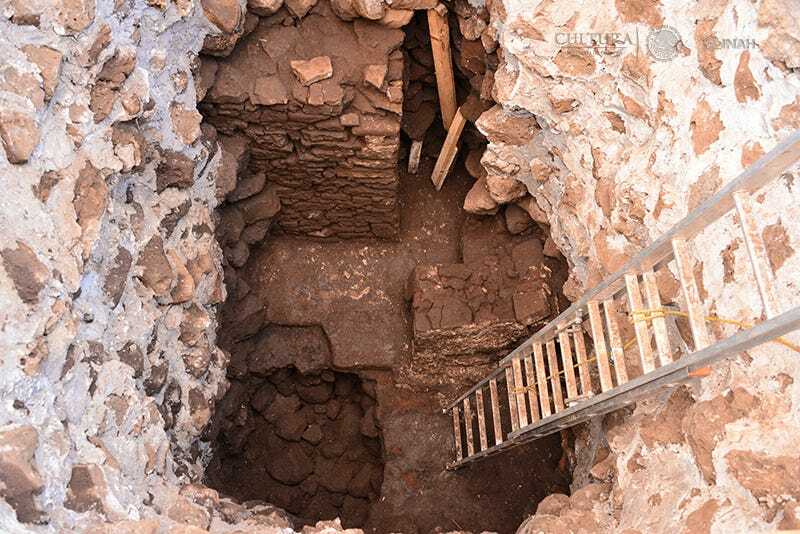 While checking for structural damage inflicted by the 2017 earthquake, archaeologists with Mexico’s National Institute of Anthropology and History (INAH) made a remarkable discovery: a temple located about six feet below the top of the Teopanzolco pyramid, a structure the Aztecs dedicated to Tláloc, the Aztec rain god. It was not uncommon for ancient cultures to build upon older structures, but in this case, the archaeologists had no idea a temple was located within. While performing their survey, the INAH archaeologists noticed that some stones on the top of the pyramid were loose. The hidden temple revealed itself as the scientists were searching for firmer terrain. An INAH team member inspects the ancient temple. The newly discovered temple measures about 20 feet by 13 feet (6m x 4m), and it dates back to the Middle Postclassic period, sometime between 1150 to 1200 AD. The temple was built by the Tlahuica culture, one of several Aztec peoples living in central Mexico shortly before and during the time of the Spanish conquest, which started in 1521. The temple and the Teopanzolco pyramid built upon it, which dates back to about 1300 AD, are located in Morelos state, about 43 miles (70 km) south of Mexico City. 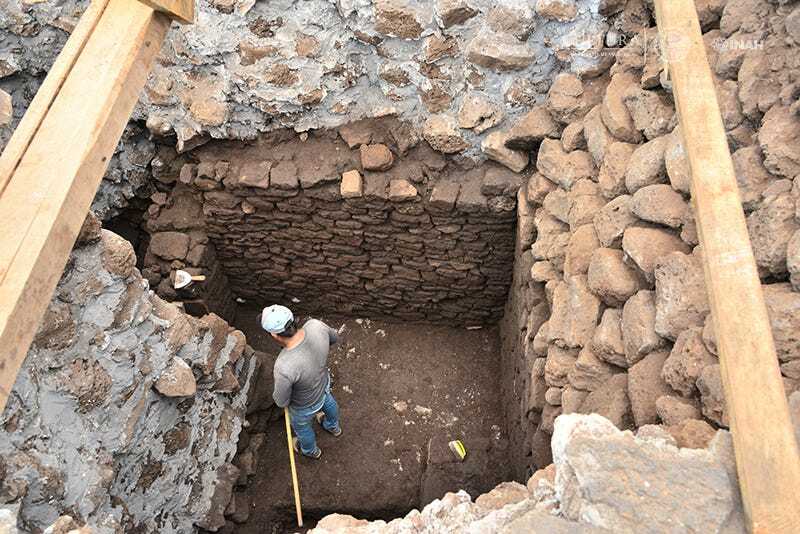 The newly discovered temple is quite possibly the oldest evidence of human occupation at the Morelos site – an important finding that represents a very early stage of the Aztec period. “Despite what the earthquake meant, we have to be grateful that this natural phenomenon revealed this important structure, which changes the dating of this archaeological site,” said Isabel Campos Goenaga, director of the INAH Morelos Center, at a press conference held earlier this week. The walls of the temple were found next to the remains of a stuccoed column that once supported a roof. Intense humidity has obliterated most of the stucco walls, but the archaeologists managed to salvage some fragments for study. The INAH archaeologists say it likely represents the first constructive phase of the Teopanzolco pyramid, predating the famous Templo Mayor, which dates back to the Late Postclassic period (1200 to 1521 AD).